The NeoCon-driven US imperial policy is building its pharaonic monuments, it's own Babel Tower, even before it can show any tangible positive result. I mean: a positive result measured at it's own designs. No cheap oil is flowing. No secure permanent military bases have been established. No way to intimidate Syria and Iran. No Iraqian oil money to pay for the astronomic costs (and wasted money) of the Iraq adventure, as promised by Paul Wolfowitz in 2003. No better illustration of this, than the effort to build a Mesopotamian palace with tennis courts, swimming pools in the Baghdad Green Zone, under mortar fire, truck-bombs and failing supply of hamburgers by the Kowayt convoys that should arrive every week. That palace, cost: $592 millions, is to house "the largest embassy in the world". The Mother of All Embassies, so to say. Of the seven wonders of the ancient Mediterranean world, including the Hanging Gardens of Babylon and the Colossus of Rhodes, four were destroyed by earthquakes, two by fire. Only the Great Pyramid of Giza today remains. We no longer know who built those fabled monuments to the grandiosity of kings, pharaohs, and gods; nowadays, at least, it's easier to identify the various wonders of our world with their architects. 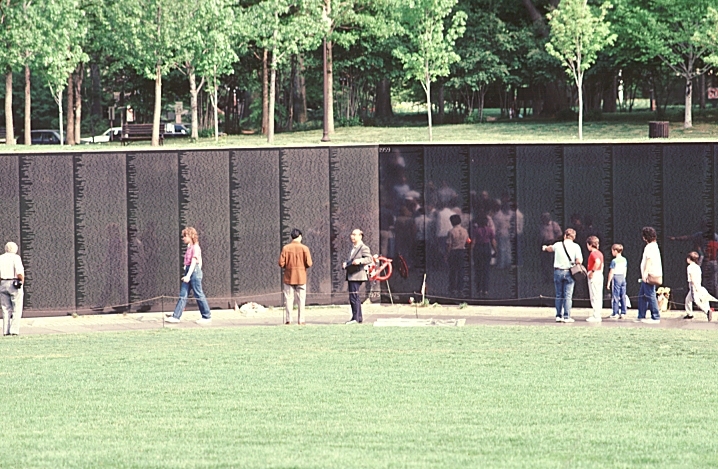 Maya Lin, for instance, spun the moving black marble Vietnam Memorial from her remarkable brain for the veterans of that war; Frank Gehry dreamt up his visionary titanium-covered museum in Bilbao, Spain, for the Guggenheim; and the architectural firm of BDY (Berger Devine Yaeger), previously responsible for the Sprint Corporation's world headquarters in Overland Park, Kansas; the Visitation Church in Kansas City, Missouri; and Harrah's Hotel and Casino in North Kansas City, Missouri, turns out to have designed the biggest wonder of all -- an embassy large enough to embody the Bush administration's vision of an American-reordered Middle East. We're talking, of course, about the still-uncompleted American embassy, the largest on the planet, being constructed on a 104-acre stretch of land in the heart of Baghdad's embattled Green Zone, now regularly under mortar fire. As Patrick Lenahan, Senior Architect and Project Manager at BDY, has put it (according to the firm's website): "We understand how to involve the client most effectively as we direct our resources to make our client's vision a reality." And what a vision it was! What a reality it's turned out to be! The (walled) area has the size of an urban district. The about a 1.000 strong staff (not counting family members to be housed in villas and apartment blocks on the site) and several 1.000s of other personnel (local staff, guards, maintenance) and protection (US army, American contractors). The building itself is done by kowaitian firms, employing cheap east-asian workers. It is not difficult to imagine, what the Baghdad man in the street feels about all that. Those feelings are probably stronger even, than they had against Saddam Hussein's frenetic palace-building. I suppose, that the New Orleans Katharina-victims, who are still waiting for reconstruction, will share those feelings. 1. An overview of the site. 2. residence of the Deputy Ambassador. 3. A Marine Guards an entrance. 4. Tennis- and Basketball facilities. 5. Apartments Building with palm garden. Following successful completion of the preliminary concept plans and the full embassy master plan, Berger was commissioned to prepare the design-build “bridging documents” (based on 35% design) for construction of the self-contained embassy compound. Berger Devine Yaeger, Inc. (BDY) was the architect for this work. The construction (currently underway) is being executed in four concurrent packages. This self-contained compound will include the embassy itself, residences for the ambassador and staff, PX, commissary, cinema, retail and shopping, restaurants, schools, fire station and supporting facilities such as power generation, water purification system, telecommunications, and waste water treatment facilities. 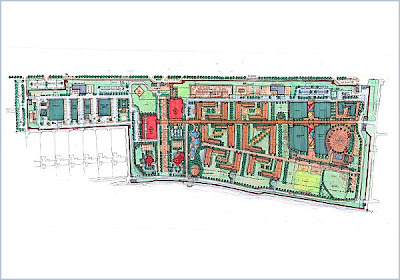 In total, the 104 acre compound will include over twenty buildings including one classified secure structure and housing for over 380 families. In short: This construction was designed to symbolise the New American Century, the power of intimidation of the sole "superpower". It goes along with the huge US military command center "Camp Victory" that is housed, somewhat to the Nort-East of Baghdad, in a former Saddam palace, complete with zoo. During my whole life, from when I was a pupil in an Amsterdam high school, until the end of the century, when we criticised US policies, we were told that, perhaps we were right, but that it was dangerous to say it too loudly, for, otherwise, the US could return to "isolationism" - one of the causes of the European crises, leading to the Second World War, in the 20s and 30s. The new European generation can no more be convinced of that: The US have, since 1990, and à fortiori, since 2001, already returned to an isolationism that is more agressive than 75 years ago. They are not only celebrating it at home. Now, they have also exported it. A new phenomenon in history: An isolationist imperium! Like Nietzschean "Übermenschen", unmoved by the feelings of others, even provokingly humiliating them, they offend allies, pretend to rob nations of their wealth in the name of some free-market principle.